Decades of progress in reducing the spread of measles have been stymied by outbreaks in Europe and the Americas, particularly in Venezuela. According to a recent report authored by the World Health Organization (WHO) and the U.S. Centers for Disease Control and Prevention (CDC), the number of cases of the highly contagious disease reported worldwide has jumped by 31% between 2016 and 2017. 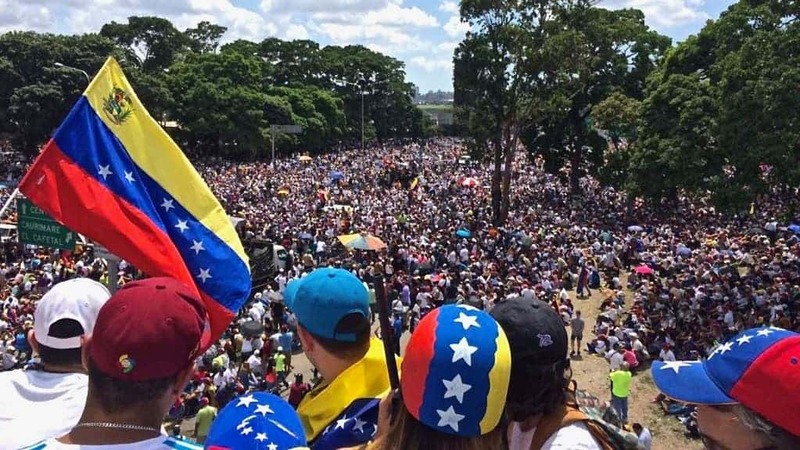 Venezuelans protest in 2017. Credit: Wikimedia Commons. Measles is a highly contagious disease caused by a virus that is spread through the air by breathing, coughing, or sneezing. Symptoms of measles are rashes, high fever, coughing, a runny nose, and red, watery eyes. Although severe cases are rare, measles can cause swelling of the brain and even death. The disease is especially severe in infants. It’s, in fact, the leading cause of vaccine-preventable infant deaths. Before the introduction of measles vaccine in 1963 and widespread vaccination, major epidemics occurred approximately every 2–3 years and measles caused an estimated 2.6 million deaths each year. Thanks to modern healthcare and vaccination policies, the spread of the disease has been greatly reduced. For instance, between 2000 and 2017, reported measles cases dropped by 80% worldwide (from 853,479 to 173,330). During this time, researchers estimate that vaccination prevented 21.1 million deaths. However, when vaccination coverage is poor, measles can easily resurface even in regions where it had previously been eradicated, largely due to international travelers carrying the virus. Just two years ago, the WHO stated that measles was no longer circulating in the Americas. Today, endemic measles is back on the American continents, largely due to a terrible outbreak in Venezuela: the country where inflation reached 1,000,000% and whose public system has gone into disarray could no longer afford to properly organize vaccination campaigns. Today, there are 3,545 confirmed cases of measles in Venezuela since 2016, which have resulted in 62 deaths. From there, Venezuelan refugees have spread the disease to other parts of the continent – especially in Brazil. Estimated annual number of measles deaths with and without vaccination programs — worldwide, 2000–2017. Credit: CDC. Measles outbreaks have also appeared elsewhere, including Europe and some parts of the United States. This time, however, the stead of the disease was not triggered by civil upheaval and economic collapse, but rather by the refusal of some parents to vaccinate their children. From 2016 to 2017, the number of cases of measles in Europe rose by 458%, to 24,356. According to the latest entry in the Morbidity and Mortality Weekly Report, there were 173,300 cases of measles reported worldwide in 2017, compared to only 132,328 in 2016. That’s still a much better situation than the world was facing only two decades ago. However, it’s disappointing to see how so much hard-earned progress is dismantled by poor government policy on one hand and pure ignorance in wealthy countries on the other hand. To be fair, the authors also note that many of the newly added cases are due to some countries improving their reporting. This study shows just how vulnerable populations can be, even in places where measles had been previously all but eradicated.